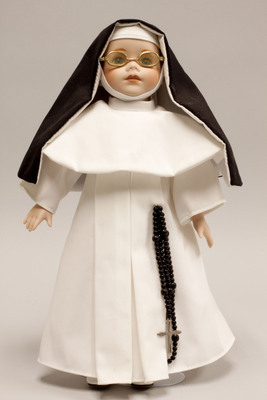 Porcelain doll is wearing a habit typical of Dominican Sisters. The Dominican Sisters were first founded in Prouille, France in 1206. The doll is wearing a white habit with white collar, white wimple, and black veil, with a black rosary hanging from her waist. The doll is also wearing a pair of metal eyeglasses.